In this abstract environmental landscape, space and time are continuously being reshaped. As with dreams and memories, the imagery lies within the boundary of the familiar and the surreal. The layered and distorted textures taken from across the United States (New Mexico and Illinois) reveal that nature’s connections are closer and greater than they appear. The soundtrack, edited from the source footage, further dramatizes this cycle of transformation. We are transported into a place of otherness where the transitory can also, paradoxically, seem enduring. In this one-shot video we witness a representation of life’s flux via an organic collage of layered reflections and manipulated audio taken from the source footage. By exposing and dramatizing continuous change and inevitable demise, we can challenge the fear of and fascination with our oscillations towards the unknown. Natural elements set this scene, as the subject’s luminiferous body contorts and dissipates into the dark landscape. Its position and form changes as it appears to straddle multiple places – the illusion created by nature, the distortions made by the artist. Trees that suffer through drought make sounds through their empty collapsed water columns caused by increased pressure within internal tubes called xylem. Xylem normally spread water through trees’ trunks, branches and leaves creating growth and producing oxygen for our world. The audio emitted from these cavitations is out of our range of hearing. Through moving abstractions of manipulated forest reflections on water, a visual representation of the trees’ calls reveal themselves. Hints of soundwave imagery appear, and we can see their screams within the sustenance that they need to survive. If we could hear them, would we tend to our planet’s environmental needs with greater urgency? Humans develop systems and structures to feel in control of nature’s constant flux. 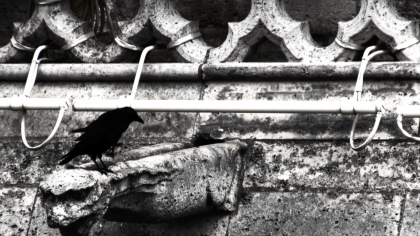 We create symbols and timeless myths to embellish the mundane and to cope with our mortality. “A Tear in the Fabric” depicts how we see and interpret natural anomalies as miracles, omens, and answers. Through the camera’s angle of vision and sound manipulation, a portion of the ordinary is hidden amidst a background that alludes to the extraordinary. The subject appears alien to this world but, like a philosophy of most video and film, is a lie that reveals greater truths about what we see and what we want to believe. A romantic urban landscape becomes a place of anxiety, relaying the tension of our young century. This single-shot video, reinforced by the manipulated sound from the source footage, merges nature’s beauty with fear. 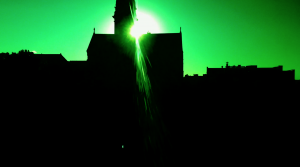 A menacing sun follows us through the city – alluding to disruptions of peace, visions of our end, and a reminder that no matter how far our culture and infrastructure evolve, we will never be in full control of the future. This expressionistic single shot video captures one moment of natural movement and patterns. Manipulated audio from the source footage adds the suggestion of horror as nature reacts to itself. The sum of its parts contribute to a larger whole – alluding to the idea that death is necessary for evolution to take place. White light streaks back and forth across black space at different rates, absorbed by the woman’s face and then cycling outward again. 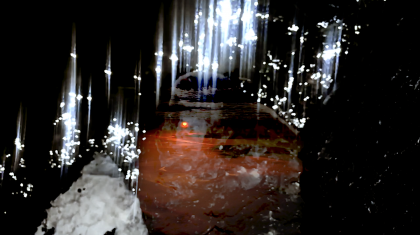 Each flash and spark declares its unique presence through assigned sounds, sampled and manipulated from the original source footage. It is as if the light were the only living element in this fluctuating environment that appears blank and stationary. The initial illusion of motion reminds us of fantastical travel through space and time as we try to connect the visual and aural data into meaningful patterns of cause and effect. The “return” to our world makes us question what is more uncanny; the science fiction or the reality. 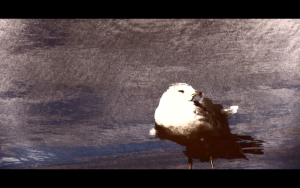 In this single-shot video, a gull appears meshed within its environment. Water, sun, earth, and wind work together to transform its appearance and location. Combined, these classical elements create natural, yet surreal, imagery – like a dream or a fractured memory. Speed is slowed down to emphasize its movement. 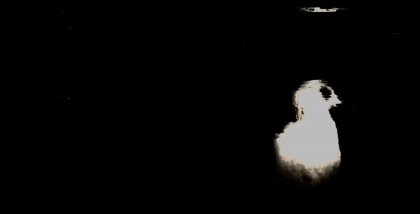 Sound, taken from the source footage, is manipulated to create a sense of displacement and to emphasize a shift in the event. Scale is altered to show that all change, no matter how small, is substantial. Size is relative, and major shifts within our world are overshadowed by what is larger. By showcasing this transformation, the subtle becomes dramatic. Nothing stands still in our world. From the gravitational pull on Earth’s tides to living beings pulled from birth to death, we live amongst and within infinite events where everything is in the process of change. In these one-shot videos, “Slip Away” and “Unrest,” buildings hide behind a natural impressionistic haze. The imagery is familiar, but it’s always at a distance, as movement, light, and sound reinforces its surrealism. 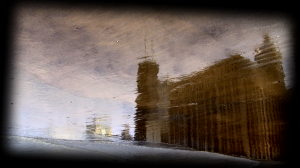 What we see is in constant flux, and the same can be said of what we view as Truth and Self. This version is a collaboration with poet, Eric Elshtain. 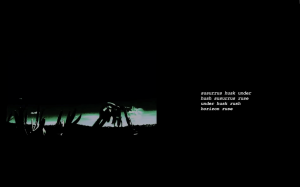 Bursts of shuddering movements and explosive blasts of sound, solely taken and manipulated from the source footage, cut through the dark quiet ambience of this distorted landscape. Through the shadows the subject ambiguously struggles toward transformation – its outcome blurring the lines between the otherworldly and what actually exists in nature. 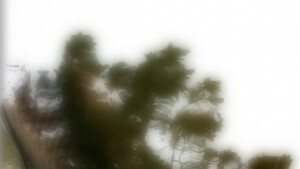 Lights pulsate and pop within the stark hypnotic field of this one-shot video that contains layers of manipulated ambient sound from the original source recording. A collision dramatically alters the space and displaces the viewer, revealing that patterns made by the human mind are often contradicted by nature itself. 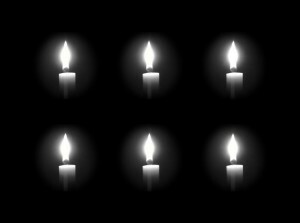 Tension and disorientation build as six symmetrically arranged candle flames stand in silence, gradually coming to life just before they’re extinguished. Using the same repeated shot, the time of their demise is extended by rhythmically altering image and sound while layering the clip’s audio. Not only is a concert of light created, but also an original sound composition is revealed built entirely from a lone sample of breath that blows out the flame. 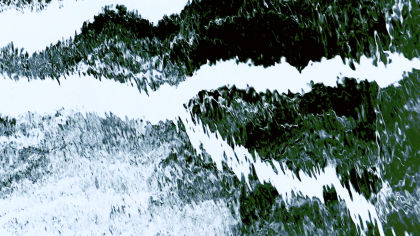 This real-time piece depicts the distorted reflection of the artist’s face on water. Mainly relying on natural abstraction and layering instead of digital editing and filtering, his image is in constant flux when a foreign object breaks through the water’s mirror. Combining the rapid edits of city elements such as architecture, sculpture, lighting, and transportation with the artist’s own cardboard skyscraper creations and video feedback, Cityscape #1 delves into the frantic rhythms of urban modern tension in hopes of moving beyond the weighted pull that daunts our new century.